Movie Night: What Happened at Dyatlov Pass? Movie on the Way! What Happened at Dyatlov Pass? Movie on the Way! What Happened at Dyatlov Pass? Movie on the Way! : "
Decades before three campers disappeared fictitiously in The Blair Witch Project, an incident happened in Russia that resulted in the mysterious deaths of nine people in the northern Ural mountains. The night was February 2, 1959. The mystery lingers to this day. Many years later a movie is finally coming out detailing this strange occurrence. According to The Hollywood Reporter director Simon Fellows (Malice In Wonderland) will direct an adaptation of Alan K. Barker's book Dyatlov Pass, based on true life events which saw nine students die in unexplained circumstances. The script is being penned by Andy Briggs, and the production is anticipated to begin shooting next summer in Eastern Europe. 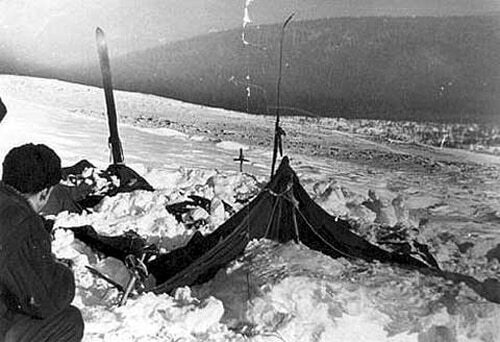 In a nutshell the Dyatlov Pass incident refers to an unsolved mystery that occurred in the northern Urals which saw a group of ski hikers tear open their tent from the inside and leave barefoot in a heavy snowstorm. Though there was no sign of a struggle, two victims had fractured skulls, one was missing her tongue, and clothing belonging to the victims contained high levels of radiation. Soviet investigators concluded that 'a compelling unknown force' had caused their deaths. Spooky? You betcha! More as it comes.